Gambel’s quail are very common in Arizona. 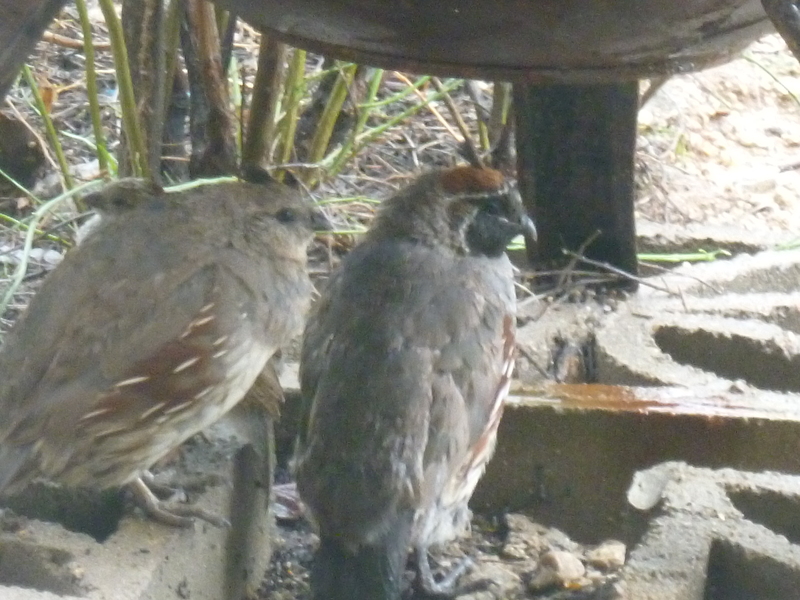 Out the window I spotted a COVEY, small family, of Gambel’s quail covering themselves from the rain. These birds PUFF up, for insulation, with their feathers to help stay warm. Gambel’s quail were discovered by Dr. William Gambel in 1841 and named in his honor. These quail hide and nest under brushy, thorny shrubs, and dine on seeds, leaves, cactus fruits, ants and other insects. Gambel’s quail live in the hot deserts of the Southwest — the Sonoran, Mohave, and Chihuahuan at elevations below 5,000 feet. This photo of the quail chicks with mom and dad was taken from our back patio. 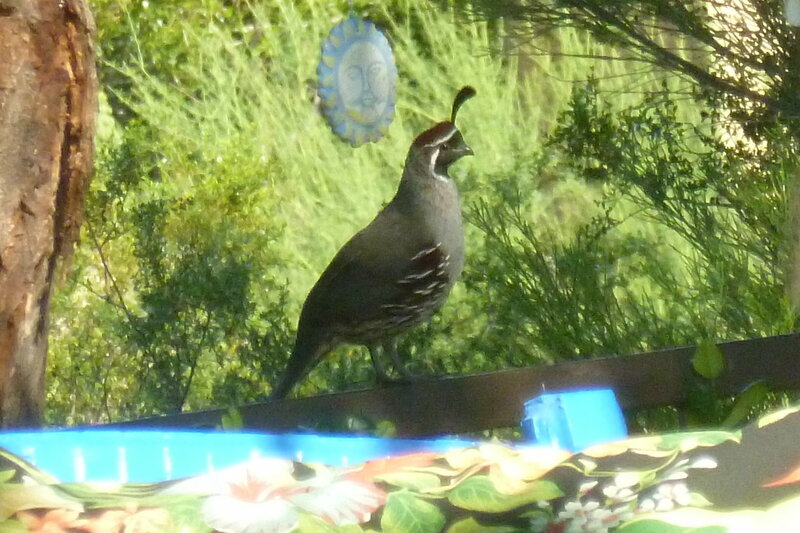 The female Gambel’s quail is the lookout while the family eats thistle seed I keep on the porch. 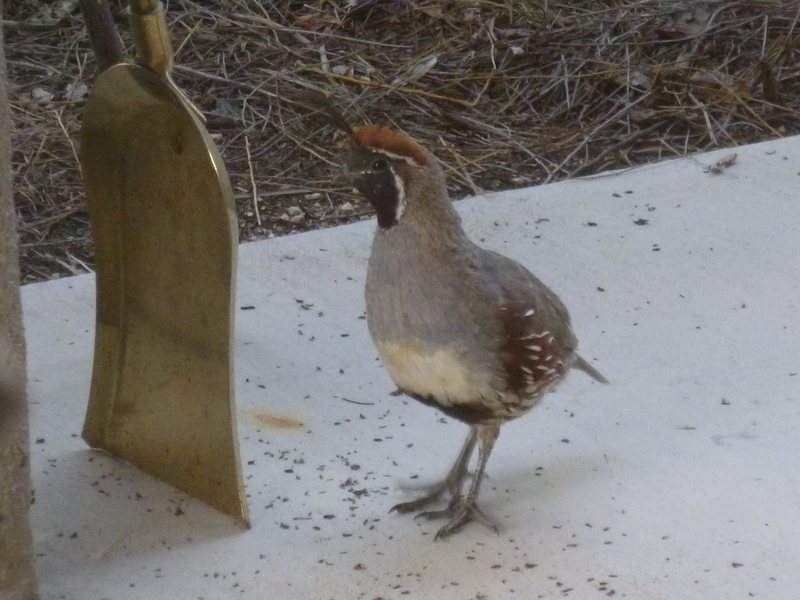 If there is any danger, the lookout will issue an alarm sound and the Gambel’s quail family will sprint for cover! These delightful, lovable birds prefer walking to flying and typically fly only to avoid danger or to roost. How fast can Gambel’s quail run? These desert quail can run up to 15 miles per hour. If startled and to avoid a predator they can fly up to 40 miles per hour. 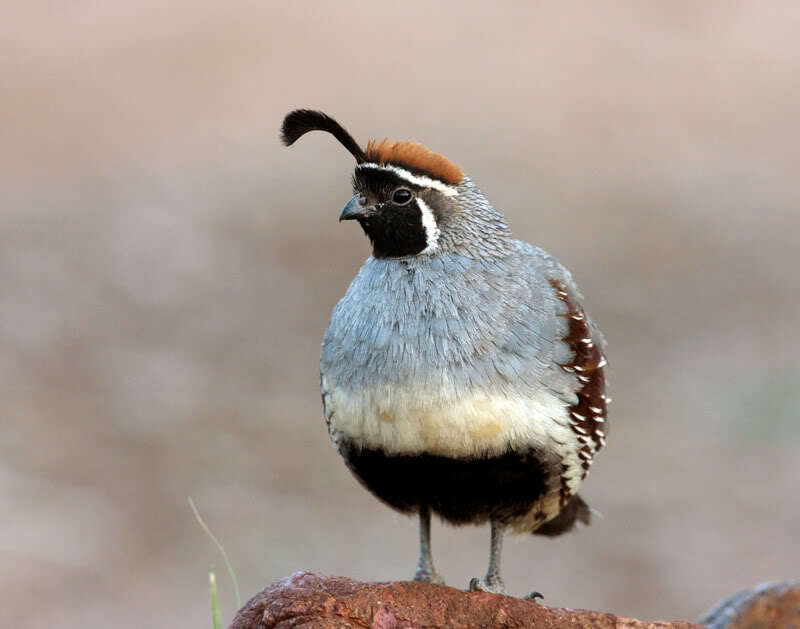 Both male and female Gambel’s quail have a comma-shaped bobbing plume of feathers on top of their small heads. Males have gray, cream and black patterns that serve as excellent camouflage. Female Gambel’s quail lack the distinctive head pattern and are grayer overall. 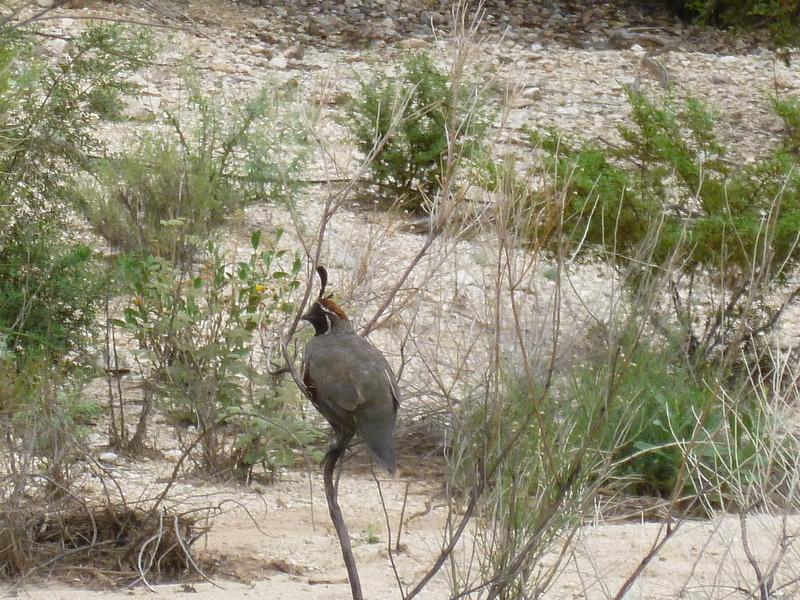 Everyday we see these chunky quail running from cover to cover in the desert shrubs. The dense cover provides shelter and camouflage for these unique desert birds. They are so entertaining to watch! Female quail usually select nest sites on the ground. Preferably this bird nest is hidden under a shrub, rock, or protected site. This bird’s predators are coyotes, bobcats, snakes and carnivorous birds. 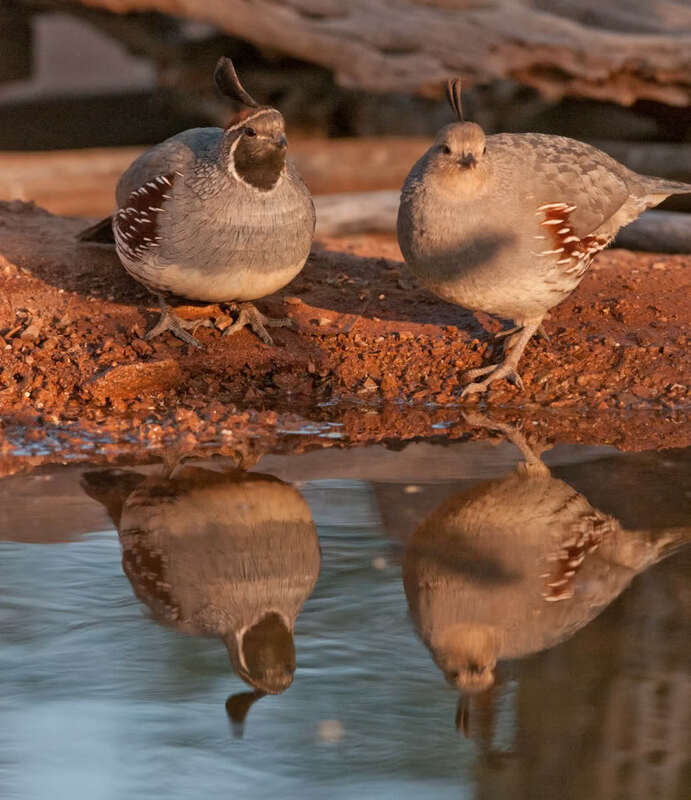 Extreme weather can be the greatest enemy of the Gambel’s quail because harsh conditions reduce the growth of the plants that provide this bird with food and shelter. We have had the exciting experience of watching as they go from eggs to chicks ready to run with their mom and dad! The quail chicks eat mostly insects like ANTS, while the parents eat the seeds of berries, grasses, cactus fruit, and other plants. Gambel’s quail obtain water from plant material, but still need some free water. We keep water available throughout our property. The baby quail stay close to their parents. 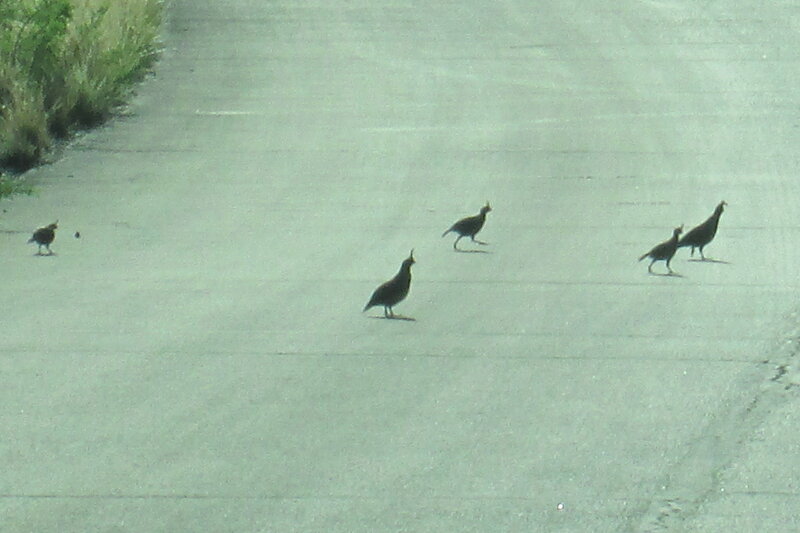 Gambel’s Quails run across the road in groups called coveys that can include a dozen or more birds. The covey, quail family, form a line as they dodge in and out of cover in the desert sun, with the father leading the way. The baby birds are followed by the female quail pulling guard duty in the rear. The lookout quail will make distinct warning sounds to alert others. 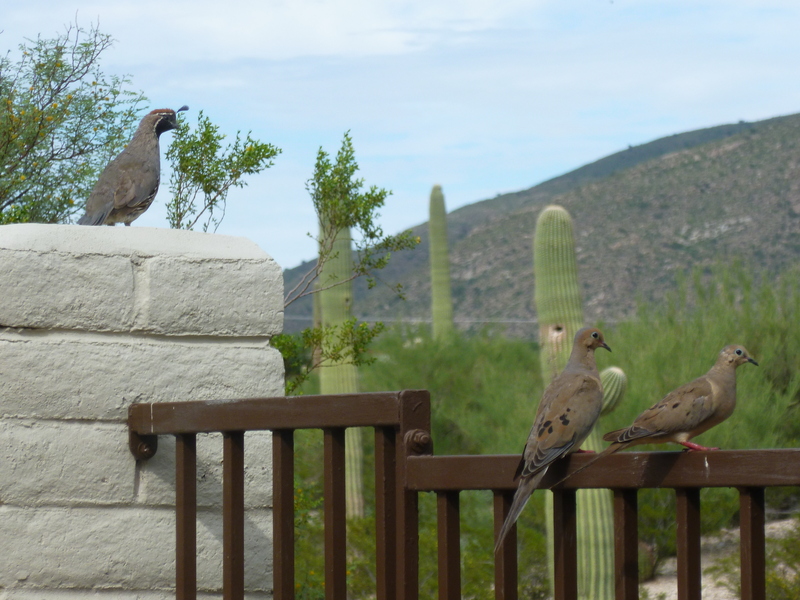 Male Gambel’s quail are heard making calls for the family, covey members. Listen to the short youtube video to hear the male quail calling his covey. Gambel’s quails are sometimes called Desert quails. Average life expectancy for a wild desert quail is 1.5 years. Mom lays 10 or more eggs in a nest protected by vegetation or under a rock. 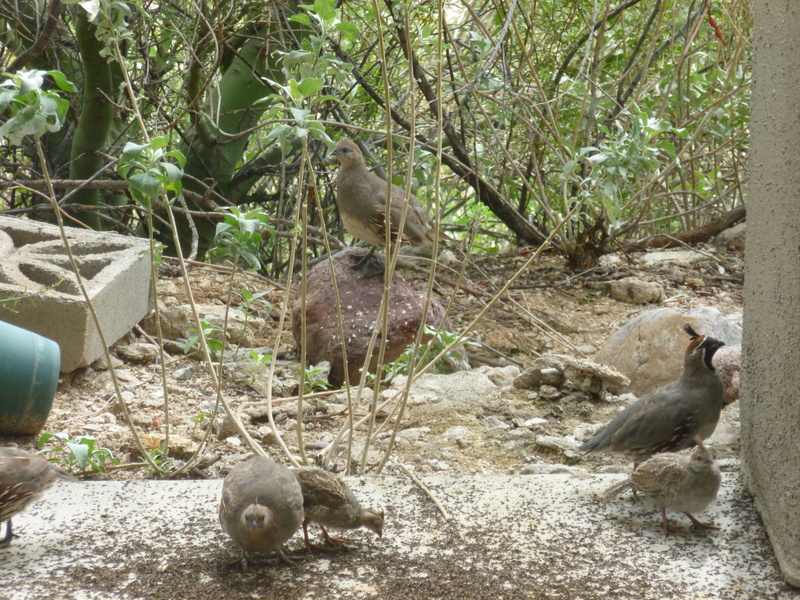 Female Gambel’s quail are in charge of the incubation. In approximately 3 weeks, the quail chicks will all hatch on the same day and within hours will be out of the nest to run around with mom and dad. Gambel’s quail have been introduced to the Hawaiian Islands. Love the picture of the male quail! I’m doing an animal alphabet on my blog and would like permission to use your photo [6th one down] as a reference for a watercolor painting. We don’t have any quail in my area. You have my permission, enjoy! A brilliant video. Listening to the call of the quail brings back memories when as a youngster we spotted them in deep forests (India). Now it’s years since I heard or saw them. Thanks for the share. Nice comment and I’m happy you enjoyed the post. 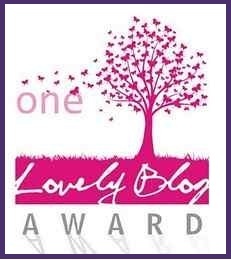 They are really sweet little creatures – such a short lifespan though! I like the picture of the male admiring his own reflection! Yes Cathy I was surprised about the short life 😦 That male will head but that reflection, it is so funny! Next Next post: Curve-billed Thrasher – AZ desert birds with personality!